Do You Want To Learn How To Earn An Extra $5k A Month? Do you want to be financially free? Do you want to know the advanced strategies to making six figures a year from a computer? Are you working your 9-5 job? When you read Affiliate Marketing: The Online Marketing Blueprint for Internet Marketing, your marketing skills will vastly improve each day! You will discover everything you need to know about affiliate marketing! This book breaks training down into easy-to-understand modules. It starts from the very beginning of affiliate marketing, so you can get great results – even as a beginner! 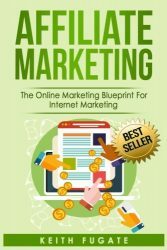 A Confusing Overview of Affiliate Marketing This book starts with a history of affiliate marketing. The first two chapters have sections in them that look almost directly copied from the Affiliate Marketing Wikipedia Page. You could learn the bulk of these two chapters from simply reading the Wikipedia page for free.